Holy cow, it's been a crazy week! It's been kind of a crazy month, actually--mostly good, but there have been some touch 'n' go moments that have just made me want slink into bed, pull the blanket over my head, and never come out! And with February being a short month, I have never before found myself wishing it was a leap year like I am right now! Oh, to have that ONE extra day! But, alas, the end of the month is a mere 2 days away and so are a whole slew of due dates. This trio of cards has nothing to do with my February deadlines, but I did want to share them before the month has passed us by. I made them using Gossamer Blue's On My Desk, as well as a couple of items from the GB January kits. 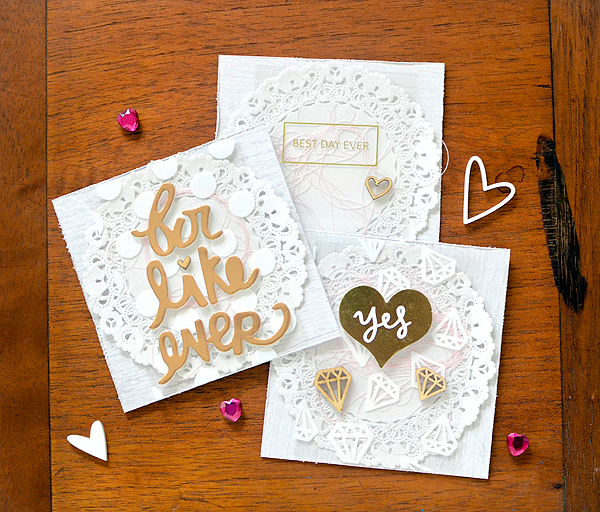 When I spread the collection out on my desk, I noticed a really fun love & marriage theme. 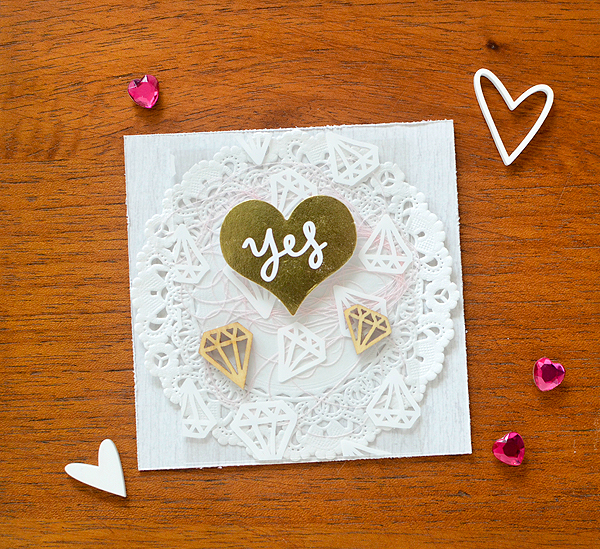 The diamonds, the big gold heart with 'YES' printed on it, the 'Best Day Ever' overlay...From the engagement to the Big Day, they all just seemed to perfectly say wedded bliss. It's a bit hard to see, but there is a pile of messy blush pink thread underneath each overlay. 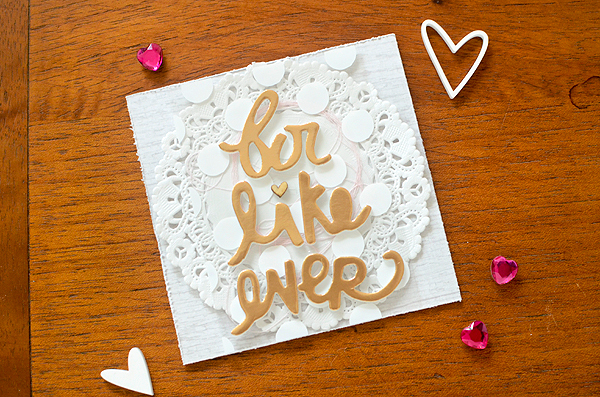 The doilies are from my Etsy shop, and the 'for like ever' foam Thickers are Dear Lizzy (they were in the January LP Themed Add-on kit). They fit so well with this theme. 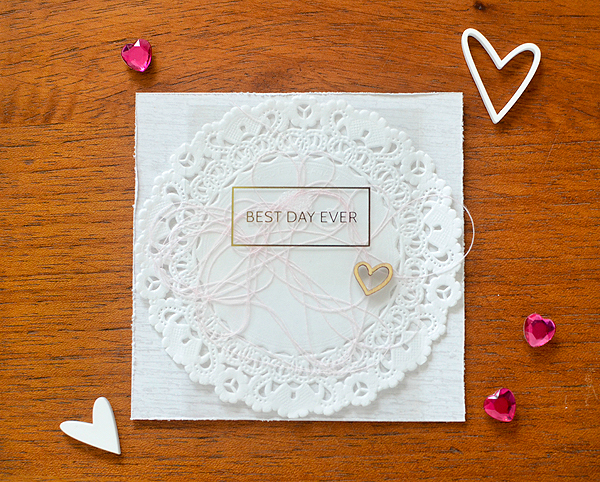 The trio will be listed very soon in my shop, too, so you can get a jump on wedding season preparation! I hope you are having a lovely day, friends! Oh Rebecca, these are gorgeous!